The only known example of an unrecorded 1838 American issue of A. Arrowsmith's Globular Map of the World. Shows Republic of Texas. Arrowsmith's Map of the World on a Globular Projection, Exhibiting particularly the Nautical Researches of Captain James Cook, with all the recent Discoveries to the present Time, The Whole Engraved under the immediate Superintendence of, corrected and improved , by Samuel Lewis, Geographer. A late unrecorded state of Arrowsmith's double hemisphere map of the world on a globular projection. Dating to 1838 and published well after the death of both Aaron Arrowsmith and Samuel Lewis, this is without a doubt the last iteration of this seminal map. The present example follows the re-engraving of Arrowsmith's globular projection by Philadelphia publisher Samuel Lewis for sale to American audiences. The Lewis re-engraving, which was issued in partnership with Aaron Arrowsmith and T. L. Plowman, appeared in 1809 and is itself extremely scarce, with only town examples being known. This variant, published 19 years later, is even rarer and is the only known example. Arrowsmith's original map of 1794 was one of the great cartographic achievements of his age. The map was designed to illustrate the important discoveries and navigations of Captain James Cook. All subsequent variants on Arrowsmith's map follow his basic globular model and include both an illustration of the Great Navigator and markings showing the tracks of his three voyages of discovery. 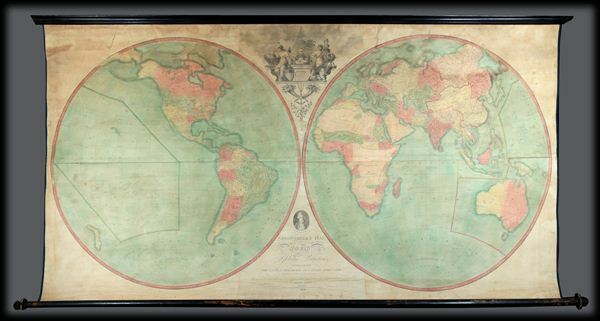 In 1808, when Lewis re-engraved Arrowsmith's map for the American market, he included some updated information and a fully re-engraved cartouche work. Lewis changed the title from Map of the World on a Globular Projection to Arrowsmith's Map of the World, no doubt hoping to capitalize on the Arrowsmith's well-deserved reputation as a talented and meticulous cartographer. He also removed the dedication to Alexander Dalrymple, the British Hydrographer, in favor of various decorative elements. Cook's portrait however remained, though relegated to the lower cartouche area. Cartographically, the Lewis American edition of this map, published by T. L. Plowman of Philadelphia, is with only a few minor exceptions almost identical to the 1808 Arrowsmith english edition. Lewis offered his version of Arrowsmith's map by subscription and, in so far as we can tell, it must not have been very popular as the map never reached a broad audience – thus accounting for its extreme rarity. Unlike the British edition, the American edition seems to have been issued only in wall map format as we have identified no dissected examples. The present example, issued in 1838, reflects significant updates and additions throughout, though follows Arrowsmith's basic globular model and Lewis's alternations. The inscription, bottom center, suggests that the map features 'corrections, additions, and improvements by an experienced geographer,' though who this might have is unfathomable. These updates are most notable in the Americas. This map was issued shortly following the 1836 Treaty of Velasco that ended the Texan Revolution and brought about the ephemeral independent Republic of Texas. Thoughout the Republic Period the western and northern border of Texas was a matter of dispute, with Texas claiming ownership of much of modern day New Mexico, Oklahoma, Kansas, Wyoming, and Colorado, while Mexico insisted that he boundary be limited to the Neuces River – slightly east of today's Rio Grande border. The cartographer's choice of the Neuces River border suggests that his sympathies did not lie with the Republic of Texas. This dispute would eventually lead to the Mexican-American war and the cession of Upper California to the United States. Additional modifications and adjustments are evident throughout and include updates to both the interior and southern border of Australia – here identified as New Holland. Africa features considerable updates that might better be called regressions. Following the theories of Mungo Parke the apocryphal Mountains of Kong, which stretch laterally across the continent, here join with the hypothetic Mountains of the Moon – a sharp contrast to the more technically correct mapping provided by Lewis in 1809. In our edition Lake Malawi, however, though still retaining an embryonic state, is vastly elongated and more suggestive of its true form. The remainder of the continent, following the original Arrowsmith model, remains 'Unexplored.' South America reflects the effects of its many wars of liberation under Simon Bolivar and others. New Granada, Venezuela, and other early South American states are beginning to emerge from the fog of war. All an all, this is an important, rare, and strange map. Though we know the influences behind it – Arrowsmith and Lewis - the 1838 publisher remains unknown. With no published references and no records appearing in the catalogues of any institutional or known private collections, this quite possible the only remaining example of this, the final iteration Arron Arrowsmith's seminal globular map of the word. Samuel Lewis (c. 1754 - 1822) was an American engraver, cartographer, draftsman, and geographer active in Philadelphia in the first of the 19th century. Though is place of birth is uncertain, most agree that Lewis emigrated from Dublin, Ireland, in the late 18th century. Lewis' earliest cartography work was produced in partnership with the well-known Philadelphia publishers Matthew Carey and Henry Schenk Tanner. In 1804, with the intention of republishing high quality English maps in the United States, Lewis partnered with the eminent British map publisher Arron Arrowsmith. Their first joint publication was A New and Elegant General Atlas, but many others followed including an American edition of Arrowsmith's important double hemisphere wall map of the world. Arrowsmith also worked with Jedidiah Morse, among other important American cartographers of the period. Ralph Brown considers Lewis to be "the most enterprising commercial map-maker of the period � " Lewis is best known for his map related to the expedition of Meriwether Lewis (no relation) and William Clark. In 1814 Lewis, copying directly from William Clark's manuscript, issued A Map of Lewis and Clark's Tracks across the Western Portion of North America. This important document was the first published map derived from the Lewis and Clark Expedition and profoundly transformed the cartography of the American northwest. Samuel Lewis of Philadelphia should not be confused with Samuel Lewis of London, another cartographer active during roughly the same period. Very good. Full professional restoration. Clean backing. Original rollers. Size does not include rollers, which add about 3 inches to left and right and 1.5 inches to top and bottom. Rumsey, 2618.000 (1808 edition). OCLC no. 21782688.